A concerted effort headed by Haitian and US agencies is improving a range of public health conditions following the 2010 earthquake in that nation, according to a commentary this month in The Lancet. Improvements were noted in HIV testing of pregnant women and the administration of antiretroviral drugs to those testing positive; incidence of cholera, which struck the nation following the quake; childhood vaccinations; measures to combat lymphatic filariasis, a debilitating parasitic disease; and the training of water technicians to test and protect local water supplies. 1. Eliminate vertical transmissionof HIV. 2. Eliminate the threat of epidemic cholera. 3. Eliminate lymphatic filariasis. 4. Establish a functioning, sustainable, self-correcting public health system. 5. Reduce under-5 mortality rate from vaccine-preventable diseases by 35%. 6. Reduce maternal mortality by 30%. 7. Reduce tuberculosis prevalence by 25%. 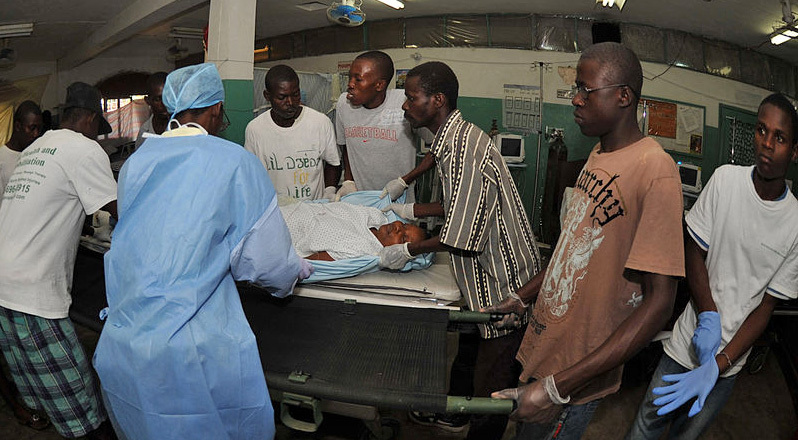 In an article titled “Cautious optimism on public health in post-earthquake Haiti,” the authors noted the measures had been taken as the Haitian health-care system recovered from the cholera epidemic. That's when officials at Haitian Ministry of Public Health and Population sought to focus on long-term health issues. The ministry, the US Centers for Disease Control and Prevention and other organizations came up with seven major goals for the effort. “At the 3-year anniversary of the earthquake, Haiti is starting to show that its health services have expanded far beyond those in place before the earthquake,” wrote the authors, all of whom are from the CDC. 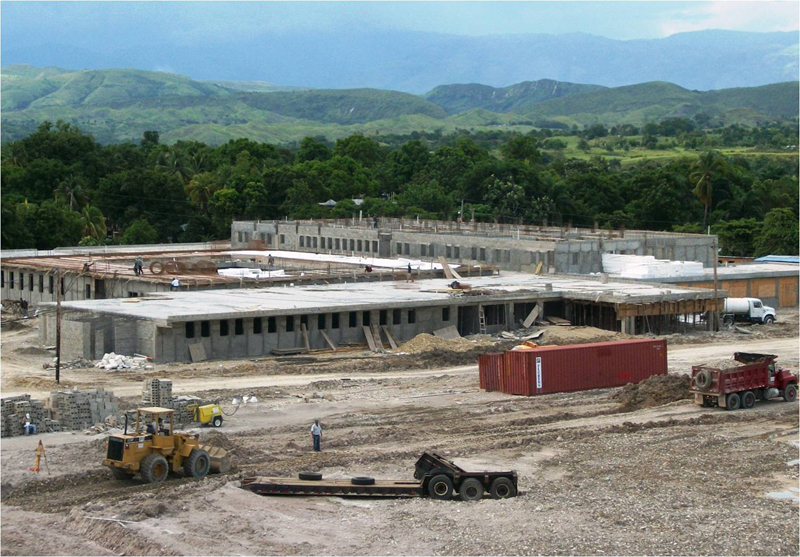 Mirebalais Hospital is being developed as a public-private partnership between Partners in Health and the government of Haiti in response to the government’s request to PIH just after the earthquake. The photo was taken in mid-2012 by Owen Robinson, Haiti Program Manager for Partners in Health. He said the hospital is almost finished and will open in a few weeks. A 55 percent increase in testing pregnant women for HIV to 201,545. A 3-month vaccination campaign in 2012 that targeted 2.5 million children. A follow up survey showed 91 percent of children had been vaccinated against measles and rubella. Some 2.3 million Port-au-Prince area residents received two medications against lymphatic filiarisis, raising the rate of residents so treated to 90 percent from 35 percent, according to a survey. Cholera rates dropped to 20 percent by in the second year of the project, compared with the first year. Last year 258 water technicians were trained and deployed to test municipal water sources and to provide sanitation education across the country. An increase in the rate HIV positive women received antiretroviral drugs to 83 percent from 54 percent. Len Maniace is an Executive Editor for Global Internal Communications at Elsevier. He worked 32 years as a journalist, mostly with Gannett in New York (The Journal News), reporting on science, medicine, environment, health-policy and government, as well as serving as assistant city editor. He later covered breaking news in New York City for theNew York Post. Outside of work, he leads an environmental sustainability program for a volunteer, nonprofit group in his New York City neighborhood of Jackson Heights, Queens. He is married and has two sons.